This is a one-page logic puzzle in Spanish. 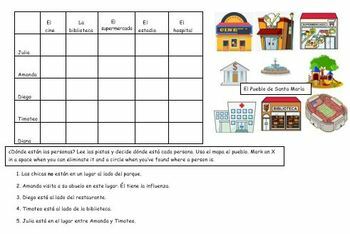 The puzzle requires students to read 5 clues in Spanish to find where 5 different people are in a pretend city. There is a small map to the right of the puzzle grid. Some of the places are "la biblioteca, el cine, el supermercado, etc." The clues require students to know prepositions such as "al lado de" and "entre." 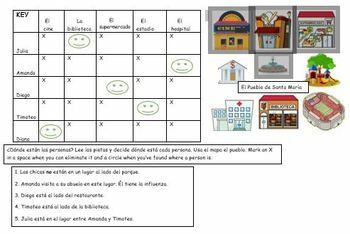 This activity is editable in case you'd like to put the directions in English. Students love logic puzzles and they're very good for the brain. Enjoy!